Everything about this place screams “come on in and relax”. From the décor and the wall painting to the lights and the atmosphere, this is a definite place to “chill-out” and kick back with your friends. These guys have picked a great spot, at the Wijerama Road- Ward Place junction. Based on the location, the first thing that comes to my mind is, this is where I want to go after a hectic day’s shopping at Odel. If approaching from the Kynsey Road side though, the two trees out front slightly hide the place but it’s not hard to spot. Obviously the two biggest questions always are, “What do they have?” and “How’s the taste?” I came here for dinner and was very pleasantly surprised as to how good the food was. If you see their menu, (it’s on their website) you’ll realize immediately that they don’t have a grand spread or variety. If you are a vegetarian, you really have only like three or four options and perhaps, the menu could do wth some expansion on that front. However what they do serve they serve really well. The Spaghetti Carbonara with smoked chicken was one of the best I have had in a long time. I also tried the grilled vegetable wrap and this too, ticked all the right boxes. The wrap itself though, would have been well placed as a hot dish and not a cold, club sandwich style but that’s a matter of personal taste. It was however very good and the potato wedges that accompanied it were delightfully crispy. 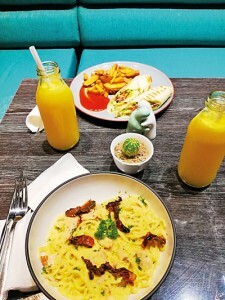 The quantities are what you would expect from a coffee shop- the portions will not leave you hungry (for the average eater) and price-wise too were not much different from others around town. Since I went for dinner, I didn’t sample their coffee items and hence cannot comment, but I did try their Passion fruit juice which was fresh and sweet to near perfection. Their next big attraction is the Ice Cream section. Yes, “Isle of Gelato” is in Colombo partnering up with Caramel Pumpkin. If you haven’t tried their gelato, you should really drop in. They really know their ice cream and flavours. Now I personally didn’t try the dessert items (was too full) but the owners recommend their “No Bake Cheese Cake”. If you need to do a little work on your own , Caramel Pumpkin is ideal – you can easily bring your laptop or books and set up camp for a several hours. 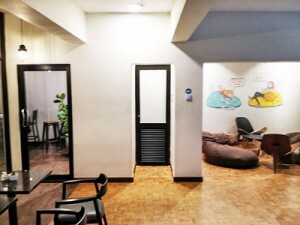 They have a bean bag lounge area as well and even their own little conference room (officially called the study room or quiet room). Best part is they don’t really charge you to book the conference room. You just have to call ahead and book the place for a minimum of 10 people. By their estimates you can get about 15 people inside.A small cozy little area separated out with a long centre table and seats around. Ideal if I needed a place to cram before a big exam or assignment with batch mates. It would also make a great place to set up some computers and have a gaming day with close friends. But booking isn’t mandatory and the number isn’t either according to the owners. If the place isn’t booked you can just walk in and do your own work in peace and quiet (they don’t play music inside this room). It is a great place to bring your kids and come for a quiet dinner. Caramel Pumpkin is a subsidiary of the Colombo Coffee Company (they sell coffee beans). 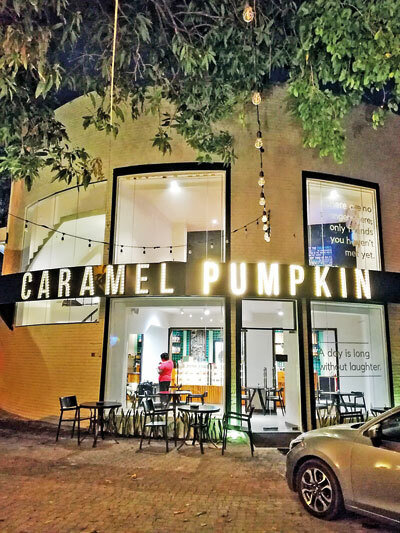 The concept of Caramel Pumpkin was dreamed up by its owners (who wished to remain anonymous) who felt there was a gap in the market – a coffee shop/hangout place that offered good food at a reasonable price. They seem to have filled that void with style.